I have encountered a great many reviews that start with "I don't know how to begin this review". By this claim the reviewer expresses doubt, but the expression of these doubts is the immediate solution to the reviewer's predicament, making both the doubts and the claim kind of moot. I was thinking of starting off this review the same way, given that this book leaves you wondering about everything, but thinking about that as an option makes it also dishonest, because I would know where to start with this review. Luckily I found a way around it so ta-da, here we go, smooth sailing, no over-explanation there at all! This book is a particular kind of great. It's unique in my view, but that's not saying much because my basis for comparison is rather small, so let me elaborate. 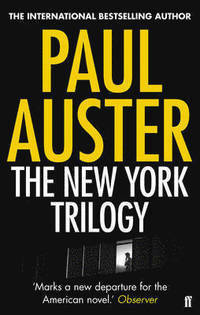 "The New York Trilogy" is comprised of three stories. This is not surprising. It makes sense. This is also the point where the "sense" stops. That big box of "sense" you're so comfortable in, all snug and cosy and warm? This book is a bucket of cold water poured all over that adorable situation, making you jump out of the box, into a beautiful realm of wild and wondrous thoughts. The book starts with the quirky idea of the first story's protagonist being called up by a person looking for "Paul Auster". Hmmm, where have I seen that name? Daniel Quinn, a writer, the guy who has picked up the phone, decides to pretend he is in fact Paul Auster, a private investigator. A rather cute idea which is only the beginning of the story, and of a trilogy that becomes a very intricate riddle, with questions of identity and purpose pervading it. The author, the characters, the reader are all embroiled in these stories of stake-outs, shadowing, minicious observations and carefully planned investigations and what starts out as a seemingly cute gimmick of having the author's name as part of the story turns into an adventure you yourself become part of. You as a reader become the investigator. You'll get clues, but without the guarantee you'll get all of them. You'll get answers, but you'll have to find more by yourself. 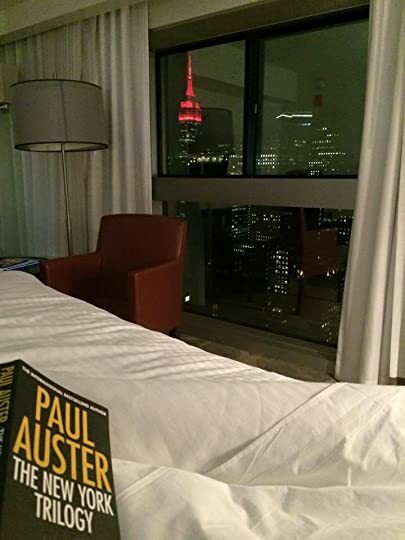 Paul Auster in bed, reading Paul Auster's novel, "The New York Trilogy", in New York City, New York. It's a book by Paul Auster, for Paul Auster, about several Paul Austers, including himself, Paul Auster, author otherwise known for rather austere writings. This book is immensely readable: the prose employed makes this novel a page-turner, the plot is always intriguing enough to keep one on his toes (understatement of the year). But it's difficult. It's like a Rubic's cube, only without the guarantee that it's actually solvable. To some readers, this is frustrating. To me, the beauty of this book is that I couldn't solve its mystery, despite convincing myself I have identified some parts of answers and some threads that connect everything. Paul Auster created one of literature's most beautiful riddles. It's a bit of a magic trick and any kind of reveal "given" to you would ruin it, so I'm not going to scour the Internet for solutions. What I am going to do, is try and solve it upon a re-read, but frankly I think I'll be a bit disappointed if I can. The only reason I didn't give this five stars is because of the slight headache it gave me. This was probably a bit self-inflicted. I always want everything to fit. This book is like a puzzle box, but the pieces inside are from several different puzzles, none of them matching the picture on the box, and none of the puzzle-sets being complete. I tried stomping the pieces together, hence the headache. I'm planning to return to it and see if I can fill in the blanks somehow, this time without stomping on the pieces and without any headaches. I know I'll enjoy it all over again, but probably a bit differently, knowing what I think I know. This riddle-nature of the book is what makes it so unique: uniquely readable, uniquely challenging, uniquely re-readable, uniquely enjoyable. And very recommendable. All that having been said, I really don't know how to finish this review. But you did finish it, didn't you? :) Nice, cursive review, Matthias! Thank you for your kind comments Jaidee, Marita and Seemita! Hi Matthias, I've been enjoying reading your reviews. Great review! Junta wrote: "Hi Matthias, I've been enjoying reading your reviews. Great review!" "The only reason I didn't give this five stars is because of the slight headache it gave me." Ha ha! Really enjoying your reviews, Matthias. Violet wrote: ""The only reason I didn't give this five stars is because of the slight headache it gave me." Ha ha! Really enjoying your reviews, Matthias." Thank you Violet! Nothing like a little bit of soothing review-writing to address those headaches ;-) Very pleased to meet you by the way, I have been enjoying your reviews as well! Dov wrote: "Love the review! You make a great case for this book, an existential comedy mystery puzzle with potential minor side-effects such as headache and cold water on adorable situations. I am putting it ..."
Good review - helped me sum up my own thoughts! Wonderful photo, wonderful caption, wonderful way of opening with a kind of meta-apology that avoids apology but really doesn't, so that that too becomes an apology! R.
And yet you manage to offer us a marvelous 'sense' of this puzzle book! I've now got a clear idea of the fun you had reading it - and proof of the fun you had writing about it afterwards! Such books are the best books. I'll be reading this one. Jane wrote: "Good review - helped me sum up my own thoughts!" Roger wrote: "Wonderful photo, wonderful caption, wonderful way of opening with a kind of meta-apology that avoids apology but really doesn't, so that that too becomes an apology! R."
Many belated thanks Roger! I'd apologize, but given all the meta-stuff already going on it felt like overdoing it. And yet you manage to offer us a marvelous 'sense' of this puzzle book! I've now got a clear idea of the fun you had reading it - and proof of the fun y..."
Ha! "The only reason I didn't give this five stars is because of the slight headache it gave me." you say. That's perfect. I read this one a while back and the moment I read your line the entire book came back to me in a flash - and with the same headache. I enjoyed the book plenty even though it required a few aspirin to get over it. Great review. I love your clever review of this beautiful book! I don't know where to begin this comment, so I'll just dive in: Your review was magnificent. I have already decided to read this book, owing in no small part to hearing Paul Auster on Radio Lab and deciding that I absolutely must read what that voice has written, but your cheeky review seals the deal. Clever people like this book, so it must be clever. Thanks! Brian wrote: "Ha! "The only reason I didn't give this five stars is because of the slight headache it gave me." you say. That's perfect. I read this one a while back and the moment I read your line the entire bo..."
Andi wrote: "I love your clever review of this beautiful book!" I'm glad you did Andi! Thanks for you kind comment. Vanessa wrote: "I don't know where to begin this comment, so I'll just dive in: Your review was magnificent. I have already decided to read this book, owing in no small part to hearing Paul Auster on Radio Lab and..."
Thank you, and not in the least for stating I'm clever. I'm beaming with pride. I'm unfamiliar with his voice, but am now very keen to hear it. Ian wrote: "Superb review, Matthias!" I don't know how to start this comment but...great review!